On the podcast this week is Dave Braun and Troy Amdahl, founders of The Oola Movement. The OolaGuys are co-authors of the International Best Selling book series that started with Oola: Find Balance in an Unbalanced World. Dr. Dave (the OolaSeeker) and Dr. Troy (the OolaGuru) are renowned experts in a proper work-life balance. They are committed to changing the world with their simple, yet life-changing, message. 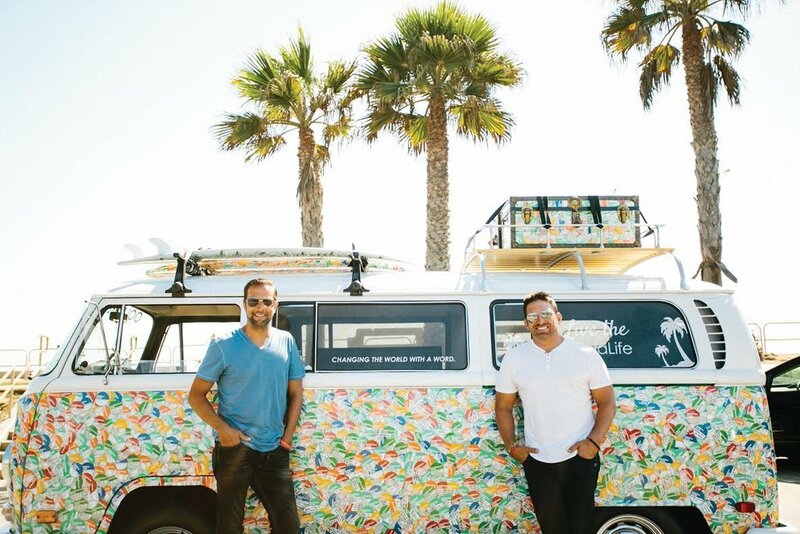 The OolaGuys are on a mission to change the world with a word (#Oola) by collecting 1,000,000 dreams in the form of handwritten stickers on the side of a vintage 1970 VW Surf Bus. By inspiring positive change, the OolaGuys are on a mission to guide people toward finding more balance and growth in the 7 key areas of life - the 7 F’s of Oola (Fitness, Finance, Family, Field, Faith, Friends and Fun). By removing the stress from a life out of balance, you will be able to reveal the greatness and purpose that is inside all of us. A better “you”, makes a better family, a better community, and ultimately a better world. In this week’s episode we chat all about the Oola Movement, their mission to inspire change, and how to find more balance and growth in the 7 key areas of life. Dave and Troy break down the three simple steps to living the Oola life, how to overcome blockers, and tools that we can utilize to move forward. We also talk about the Oola Dream Bus Tour and their mission to collect one million dreams. Dave and Troy share stories from the road, lessons learned, how you too can reconnect to your dreams, living in purpose, and SO much more! Oola Movement started in 1997 by a small group of buddies meeting once a year to set goals for the future. Now the Oola Movement, headed by Dave and Troy, has become a nationwide phenomenon and dynamic movement. Dave and Troy really believe that when your life is in balance and growing in the 7 key areas of life - Fitness, Finance, Family, Field (career), Faith, Friends and Fun - you experience less stress, more balance, and greater purpose. It was really great to hear Dave and Troy talk about the three simple steps to living the Oola life. In this week’s new episode they do more than just talk about it though, they really walk us through these steps and how to implement them in our own lives. Step 1 - Oola Wheel: Where Are You Today? Step 2 - Oola Plan: Where Do You Want To Go? Step 3 - Oola Path: How Are You Going To Get There? Dave and Troy also discuss the 7 Oola Blockers that stand in the way of you and your dreams. Those are - fear, guilt, anger, self-sabotage, laziness, envy, and lack of focus. I was so excited to learn more about the Oola Dream Bus Tour - and you guys are going to LOVE the story behind how it all got started and what it’s been like driving around a VW Bus. Dave and Troy have embarked on the Oola Dream Bus Tour, taking them to all 50 states in their VW bus. While on the tour, they make random stops throughout different cities and ask people to write their dreams on stickers and post them on the bus. Currently, the bus is covered 23 times in hand-written dreams collected from people they’ve met along their journey. They’ve collected over 100,000 dreams and they’re not stopping there! Their mission is to collect one million dreams on the Oola bus tour, and they’re well on their way. The goal of the tour is to bring the message of Oola to the people who need it the most. Everyone who sees the bus is encouraged to write down, on a sticker, a goal or dream they hope to accomplish in life. It’s not the one thing that someone else has told them to do, or the thing that they think they will do, it’s the one thing they know they need to do. That thing that is holding them back. Dave and Troy have really taken their mission on the road, in a VW bus, collecting the dreams of America, and they want your dream on the OolaBus. If they are going to follow through on their mission to “change the world with a word,” they know that a better world starts with a better you. As we become better as individuals, our families become better, our community becomes better, and the world becomes better. The Oola Dream Bus Tour has become a growing community of people who believe we are not designed for ordinary, but extraordinary. That we are not designed by accident, but for a specific purpose. I can’t wait for you guys to hear this episode with Dave and Troy. These guys are inspiring, relatable, and full of so much wisdom. They’re firm believers that wherever you are in life, there is something more that is available to you - and I couldn’t agree more.